Why was my license suspended after Kansas DUI arrest? Kansas drivers who have been arrested for driving may have their drivers license suspended through two separate processes: an administrative license suspension by the Kansas Department of Revenue and a criminal license suspension, assuming the driving is convicted of DUI. [caption id="" align="alignright" width="240" caption="The State of Kansas (Photo credit: ChrisM70)"] [/caption] If the state has enough evidence to proceed with a criminal charge against you, as mentioned above, you may ultimately have your drivers license suspended after the criminal conviction, but many drivers do not realize that it is likely their right to drive will be suspended through a civil suit prior to the criminal conviction, even if they are ultimately NOT convicted of drunk driving in Kansas. 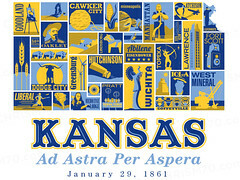 Drivers in the state of Kansas have given their implied consent to agree to submit to a chemical test if they are requested to do so by law enforcement. Prior to the test the driver should have been informed of the consequences of a test refusal. Drivers who refuse the test or who take the test and have a blood alcohol content above the legal limit of 0.08% can have their license immediately confiscated by the police. The officer should also issue them a notice called the Officers Certification and Notice of Suspension. This form is also called a DC-27 and is considered the temporary driving permit until the driver has had an administrative hearing (if requested). Drivers who have had their license restricted due to administrative actions may request a hearing within 14 days of the DUI arrest. Drivers who do not request a hearing or do not do request it properly will have their license immediately suspended. Keep in mind this is not a criminal action but a civil action by the Kansas Department of Revenue. Hearings in Kansas can be done via telephone or in-person and a request to have the arresting officer present at the hearing must also be made to the Kansas Department of Revenue. DUI lawyers can be hired to represent a driver at the administrative hearing. The benefit of doing this is to have them review the audio and video evidence and all of the documents related to the Kansas DUI arrest. Discovery information from the criminal case can also be useful for the administrative hearing. With this evidence your lawyer will be able to properly question the arresting officer and analyze the factors of the DUI stop. If you do not win at the administrative hearing and this is your first test failure (and your BAC is between 0.08 and 0.149) you will have your driving privileges restricted for 30 days at which time your right to drive is restricted by a six month installation of an ignition interlock device. Drivers who refused the chemical test will have their drivers license suspended for one year and then they will have to install an ignition interlock device for 12 months. Can I get a restricted license after a Kansas DUI arrest?